What is behind your choice of this piece of art in response to Gabrielle’s poem about the Actions at Standing Rock? 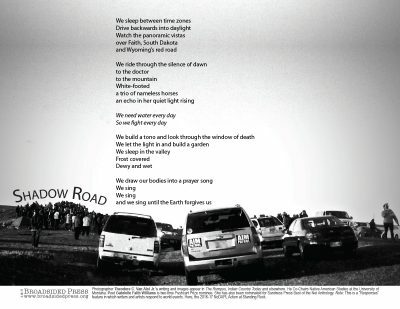 Artist Theodore C. Van Alst, Jr.: The “panoramic vistas” / “South Dakota” / “red road” all pulled my eye, all led to memories of the “prayer song(s),” the prayer actions that focused so many, in such real ways, and the photo is of the road where we sang. What led you to this poem about the Actions at Standing Rock? Poet Gabrielle Williams: In early November 2016 two of my friends and I decided to drive out to Standing Rock from our home in Las Vegas. We gathered money and items to donate from our community here at UNLV. We left late on a Thursday evening after class and drove through the night to Sacred Stone Camp at Standing Rock. We were tired and delirious upon arrival. But the engagement and spirit of the camp kept us energetic. We helped build yurts for the coming winter and watched wild horses gently wander the grassy plains. We slept in a tent covered by the shadows of the hills around us and woke every morning frosty and dew covered in our sleeping bags. The events at Standing Rock are ongoing, such as history is perpetual. So I wrote about the small moments. I wanted to honor all of those little things, the ways which we continue, the ways in which nothing ends, only begins again and again. Poet Gabrielle Williams: I suppose a “successful” occasion piece treats its subjects and its history with an authorial grace that presents the sentiment of the occasion, rather than try to RE-PRESENT or intervene in the occasion. I think art and writing only exist in real time. Writing tries to preserve a time and place, a people, a feeling that will never return. We write not about the world, but how we know the world. All art and parts of life are political. A piece of art is not political because of the content it addresses, but because it is made by a person with their own political understandings and experiences of the world and of writing. We write out of those experiences as the people we are, in the time we are. Note: This is a Broadsided Press “Responses” feature in which we ask writers and artists to create work in response to a contemporary issue, question, or concern. In this case, the 2016-2017 #NoDAPL Water Protectors at Standing Rock. Photographer Theodore C. Van Alst, Jr. was born and raised in Chicago. He is Associate Professor and Co-Chair of Native American Studies at the University of Montana. His short story collection about sort of growing up in Chicago, Sacred Smokes, will be out in 2018. His fiction and photography have been published in The Rumpus, Entropy, The Raven Chronicles, High Desert Journal, Yellow Medicine Review, and Indian Country Today, among others. Poet Gabrielle Faith Williams is currently attending The University of Nevada, Las Vegas for her MFA in Creative Writing and received a BA in Poetry from Columbia College Chicago. She is two-time Pushcart Prize nominee. She has also been nominated for Sundress Press Best of the Net Anthology. Her work has appeared or is forthcoming in Amazon’s One Day, Ghost Proposal, LEVELER, Whiskey Island, Fairy Tale Review, Ghost Ocean, and others. Poet Gabrielle Williams vectorizes in the English Department at the University of Nevada, Las Vegas.